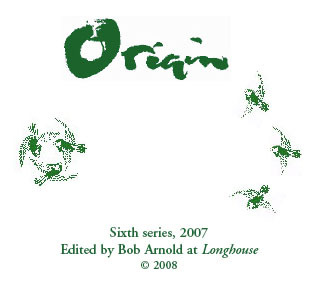 Here is an image of the Origin Sixth Series quartet & Coda (five issues in all) published as a PDF e-book on CD with nearly 250 contributors and a whalloping 1,700 colorful pages of poetry, prose, art and photographs. After nearly a year of free reading of the series from our website, now is your chance to own your own copy. Please have a look and see if this beauty can fit into your teaching plans, as well as a title to interest friends, colleagues and all libraries. We'd love it if other poets, readers & teachers took up the CD anthology as a companion. Issued in a very limited edition of only 100 copies. Order Now! ~ You can mail your order with a credit card number and expiration date, personal check, US drawn bank draft or money order. ~ Our phone line is open 24 hours a day, seven days a week. If you receive no one, please leave your order by message including your credit card and expiration date. Thanks! To avoid confusion amongst the purists, we have prepared ORIGIN, Sixth Series as a tribute to Cid Corman. No one in his right mind is attempting to do Origin the way Cid would. Impossible. For a rousing history of Origin, please read A Gist of Origin edited by Cid Corman. This sixth series is a four-issue Origin-set that leafed out during the Spring months of 2007, culminating with a 'coda' issue in December. It is the very last of Origin, ever. A small part of this series had Cid Corman's personal touch ~ in particular, some of the feature poets names chosen. After Cid's passing, poets were then gathered by editor Bob Arnold as more a celebration to poetry and for Cid. It has became a leafy canopy of many poets from around the world ~ ancients to the remarkably young ~ and all of the set is published as a PDF file. It's meant to read on the screen, and more, to be now shared as an e-book on CD. series published in attractive printed booklets available from our press. The Origin set reaches 1,700 pages, with 250 artists & poets strong. Be sure to share it. Yoshie Kaneiri ~ Reflections On "A Window Garden Journal"
ORIGIN, the Sixth Series quartet ~ edited by Bob Arnold at Longhouse. Production by Susan & Bob Arnold. Co-ordinating editor, John Martone. Philippe Denis ~ Cid Corman, Trans. Man Giac ~ Kevin Bowen, Trans. Khong Lo (Duong Khong Lo) ~ Kevin Bowen, Trans. Nguyen Quang Thieu~ Kevin Bowen, Trans. Santoka ~ Scott Watson, Trans. Kuan Hsiu ~ J. P. Seaton, Trans. Ishii Tatsuhiko ~ Hiroaki Sato, Trans. Miyazawa Kenji ~ Hiroaki Sato, Trans. Get Your Reading Shoes On!